A lot of information has just been put into the public domain. First off is to simply point readers to the website that went public today containing information relevant to the campaign of the Celtic shareholders known as the Resolution 12 Requisitioners. 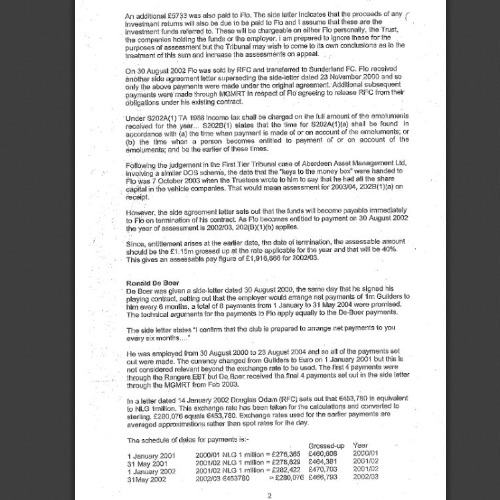 It contains a lot of referenced documentation relating to the chain of events surrounding the Rangers Discounted Option Scheme (DOS) and the open, yet unresolved judicial process around the granting of a 2011/12 UEFA license. It can be found at Res12.uk. As a group our only real interest in this relates to matters of oversight and governance. Our modus operandi is SFA reform to provide an accountable and more functional SFA which is run on more democratic principles and includes fans as stakeholders. Therefore, any materials within this that demonstrate the paucity of appropriate oversight and care align with our objectives. Unlike I suspect the requisitioners feel, we’d quite happily indemnify all those involved against any direct liability for what happened in the past if it helped lead to a better understanding of where it things went wrong and how to make it better. We want to see a better way forward not recriminations for what happened in the past. I would not blame anyone at the SFA or Rangers for not wanting to unpick what appears to have been obfuscation and a giant web of issues with the threat of legal response hanging over their shoulder. If the threat of recriminations were removed, we can then unravel how rules intended to prevent clubs relying on European competition revenues to survive seemed to have temporarily achieved exactly that. The SFA itself seems to have shifted blame to Rangers (and by extension, any liability to the newco) only to find its own power to bring charges curtailed by agreements it struck to ensure such a club made it to the league structure in time for the new season. Recriminations are not the objective for us however – understanding what happened, whether our regulators acted appropriately and the opportunity to do things better in future are. To bring transparency and accountability into the running of our game. That, I believe, is something we could all get behind and put in place the kind of protections our game needs. With that in mind, there’s two particular pieces of information within the content that we’d like to draw to your attention. The first is this. 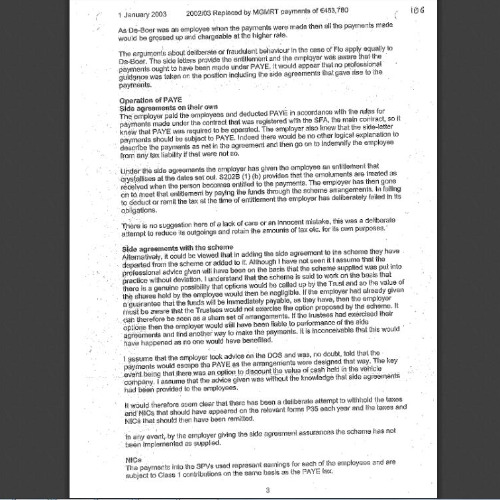 Despite all this it the liability was described as ‘potential’ in the interim accounts released the following 1 April 2011, and the auditors reported that the amount was under negotiation, despite appearing to be agreed with settlement dependant upon cash being available. This is an important distinction as the liability is described and treated as a provision in those financial statements. A provision is a liability of uncertain timing or amount. This appeared to be a liability since both amount and timing were relatively certain. Penalties being a different matter. This would leave one to assume that the auditors were also either mislead or not robust enough in their review. The effect of this ought to have been that an adjustment was made to the financial statements to record the liability (not as a provision). The ‘obligating event’ causing the liability occurred many seasons before the period end December 2010 (the avoidance of tax and NI in earlier years) making it an adjusting event and the evidence now provided further clarity on the amount at which it should be recorded. That it was agreed post December 2010 is not relevant. …. only to have it pulled after discussions over dinner with Rangers representatives at the Hotel du Vin. The principle reason for this appears to be that it was not in fact potential, but agreed. Not in fact a provision, but a liability. While the evidence before this time appeared to support that the SFA had been mislead, the picture appears to change at this time. A few months later an email chain between Keith Sharp at the SFA and Ken Olverman is shared with the Board of Rangers Oldco. 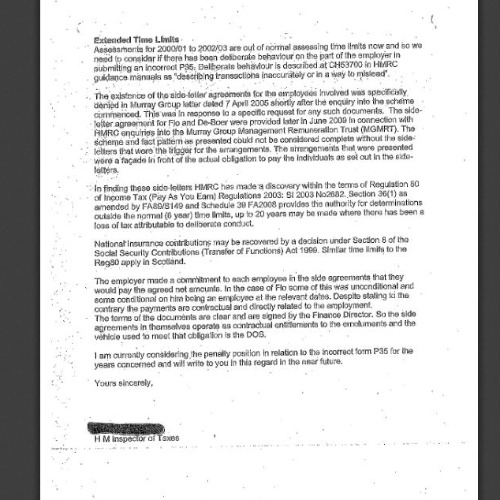 It strongly suggests that concerns had been discussed between Rangers and the SFA about the precarious financial position of RFC at that time and that there was concern of what providing further information on Overdue Payables (the DOS tax bill in particular) might cause. 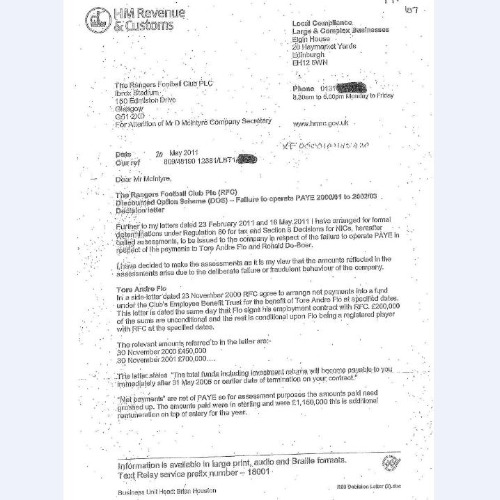 Later in discussing license applications for the 2012/13 season (aborted for obvious reasons) an internal email from Rangers Ken Olverman refers to a ‘contact in the SFA’ with which their struggles to meet the criteria could be ‘investigated further’. So sum that up:- fraudulent or negligent dealings with tax authorities, followed by misleading accounts (and probably the auditors) and an application that misrepresented the position seems to have sparked the issue. So far – that’s potential criminality, but nothing that has a real bearing going forward since all those involved no longer affect our game (though I appreciate Celtic shareholders are likely to take a different view). Where it then gets worrying is that the evidence suggests the SFA willingly helped mislead UEFA (by action or omission) rather than face the sort of existential crisis that happened anyway and which the licensing rules were there to prevent. That is an absolute failure of governance if correct, and one which the SFA has steadfastly refused to allow investigation into despite calls from member clubs and the SPFL to do so. Instead they tried to throw Rangers under the bus for it when testimony in the Craig Whyte trial made burying it no longer an option. The entire issue now still hangs over Scottish football like the sword of Damocles. The Judicial Process has failed. Perhaps without threat of liability or retrospective punishment we could find a way forward that allows mistakes to be identified and rectified. In any case, the outcome of all of this – as stated at the start – ought not to be a clamour for punishment, but steps being taken to prevent our game becoming a farce. The lack of accountability, lack of transparency and veil of self-protection only sows disillusionment and distrust in our game. The SFA is failing in its delivery of the very pillars of its existence safe in the knowledge that if you love football you’ll need to just lump it. Not if change is demanded with wallets and voices though. A path forward needs to be forged either with the SFA’s cooperation or straight through it. Waiving a right to an punishment or liability in exchange for full and frank disclosures seems a reasonable way to move things out of the current deadlock and start a conversation about making things better. Interesting insights on the accounting side. If accounts that didn’t give a true and fair view were prepared and a failure to give full disclosure to Grant Thornton also happened, leading to false declarations….. wouldn’t that open the directors/auditors up to potential litigation? There’s clear reliance on these for licensing purposes – duty of care – so the auditors would seem to be right on the hook. If this fan’s group has discovered so much of the missing evidence and the cover-up surrounding it, the cry to waive a right to administer the rules (it is not a punishment – it is a consequence) sounds just like the same thinking that gave rise to the corruption that culminated in 2012’s events. Those who had lied and de-frauded Scottish Football and those who covered up on their behalf, did so because they felt that Rangers were too big to be allowed to fail. Thye believed that punishment and consequences were for the little clubs. If at the 13th hour, after the evidence has been painstakingly gathered, against all attempts to thwart access to it, we remove the consequences in order to learn what? What more can be learned than is already evident? The rules applied to Third Lanark, Clydebank and Airdrieonians, were not to be applied to Rangers. The nimmo Commision was not to examine the DOS years, because it would remove Campbell Ogilvie’s Corporal Schulz defence of “I knew nothing”. Rangers fans did nothing wrong and there deserves to be a club, playing from Ibrox, to represent their hopes. However, David Murray, Dave king et al and all those mplicated in SFA and SFL who helped them skirt the rules, do need to face the consequences of their actions. All those clubs that lost games to them while they skirted long established financial regulations and player registration rules, deserve some evidence that this is taken seriously. Restricting the outcome to “We’ve learned lessons and we move on” just will not do.